The Celtics’ season was proceeding as planned for a total of six minute before Gordon Hayward obliterated his ankle Tuesday night, forcing the team to reorient itself without a player who figured to have an enormous role in the team’s offense. With Hayward’s ankle now shredded like carnitas, Boston’s goals are diminished, and they’ll need their young players to increase their roles. That’ll mean more minutes for rookie Jayson Tatum, who looked lively, and second-year swingman Jaylen Brown. Brown looks like he’s ready for it. The most encouraging facet of Brown’s career-high 25-point night was his aggressiveness. Brown wasn’t very efficient shooting the rock (2-for-9 on threes), but his determination put the Cavs on their heels and helped the Celtics recover some of the energy lost after Hayward’s injury. Brown would stay a potential Cavs scoring run when he’d leak out and get a transition layup after a made basket. He had a big dunk in the first quarter, which LeBron James wisely chose not to contest after he saw that Brown wanted to cram it right on his head. All night, Brown wiggled loose on little back cuts and didn’t hesitate when he got the ball on the perimeter. He’s energetic and fearless. Nobody can really stop James, but Brown seemed to relish the challenge of facing him, repeatedly going right at his chest. Brown scored eight in the third quarter and drew the charge on LeBron that spurred the Celtics’ 21-6 run. 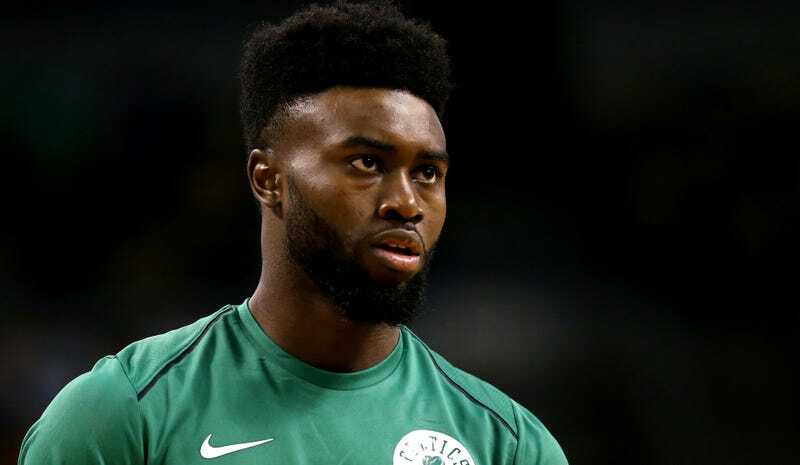 This is who the Celtics need Brown to be all season. Hayward was probably their most versatile defender—besides, yes, Marcus Smart—but now Brown has to take on a larger role on that end of the floor, although getting Marcus Morris back will help. Brown’s a different kind of player than Hayward, one who takes far fewer shots and dribbles less, though his athleticism and apparent hunger bode well. Setting career-highs in shots attempted, three pointers attempted, points scored, and minutes played in the very first game of the season is a good indicator of how much he’ll have to do this year. Boston will need Brown’s confidence if they’re going to compete for a high playoff spot without Hayward.